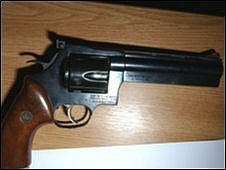 Thames Valley Police has been fined £40,000 for breaching health and safety laws when a civilian worker was accidentally shot. 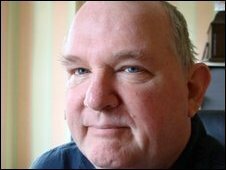 Pc David Micklethwaite, 52, shot control room employee Keith Tilbury, 57, during a firearms awareness course in Oxfordshire on 30 May 2007. The police force and Pc Micklethwaite pleaded guilty to offences under the 1974 Health and Safety Act. Pc Micklethwaite was fined £8,000 and ordered to pay £8,000 in costs. Thames Valley Police was ordered to pay £25,000 in costs. It was revealed at Southwark Crown Court that Pc Micklethewaite had failed a gun training course, but was allowed to continue working. He mistakenly loaded a Magnum revolver with live ammunition which was kept in an old Quality Street tin. The judge said this practice was a "disaster waiting to happen". Pc Micklethwaite was accused of "engaging in the pointing of weapons and the pulling of a trigger during role-play in the classroom", "failing to examine or check the round of ammunition" and discharging the gun "while inadvertently pointing the weapon at Keith Tilbury". Mr Tilbury, a control room employee for Thames Valley Police Authority, was shot in the stomach at point-blank range while he was listening to a lecture alongside 10 colleagues at the force's Police Headquarters North in Kidlington. He suffered serious damage to his lungs, kidneys and bowel and spent two weeks in intensive care. Mr Tilbury has told the BBC he is unlikely to return to work. Deputy Chief Constable Francis Habgood, Thames Valley Police, said: "We accept the sentence passed down by the court today. "A decision will now be taken as to whether PC Micklethwaite will face internal disciplinary proceedings into his conduct on the day of the shooting. "I can reassure everybody that we have changed our procedures and were recently described as a model force on firearms training issues by an independent review."